Length is the most important feature of neck jewelry. While picking a neckpiece for yourself, make sure that you consider your neck type and decide on the length of the jewelry accordingly. When it comes to an ideal neck jewelry, it is always recommended that you find one that sits right beyond your collarbone and give a ‘neither too tight nor so loose’ fit. Determine the length of your neck and add at least 2” to 4” to it for obtaining a perfect ornament. For a simple chain that would lie anywhere between your throat and your collarbone, go for a neckpiece of standard size. Usually it ranges between 16 inches and 20 inches. If you want a regular choker, the standard size of 16 inches is always the best pick. However, you have to find out the accurate measurement of your neck area in order to get a cozier fit. Well-Shaped Neck: A slim well-shaped neck can be adorned with almost all types of ornaments. Be it a minimalistic jewelry look with an elegant gold chain or a traditional appearance with heavy ethnic jewels, your slender neck will be to your advantage. Choker can enhance the beauty of your neck considerably. A simple pearl necklace can also make you look extremely graceful. However, you must avoid chunky necklaces with huge beads. Long Stretched Neck: If your neck is longer than usual, opt for jewelry that would help you hide your imperfection. A disproportioned neck can be made to look beautiful by wearing layered ornaments. A long folded beaded neckpiece will also do. Try those exclusive jewelry which come with multiple strings. It would cover up your highly prominent feature to some extent. But stay away from fashion jewels that are small and delicate. Fat Heavy Neck: Huge neckpieces will suit you the most. 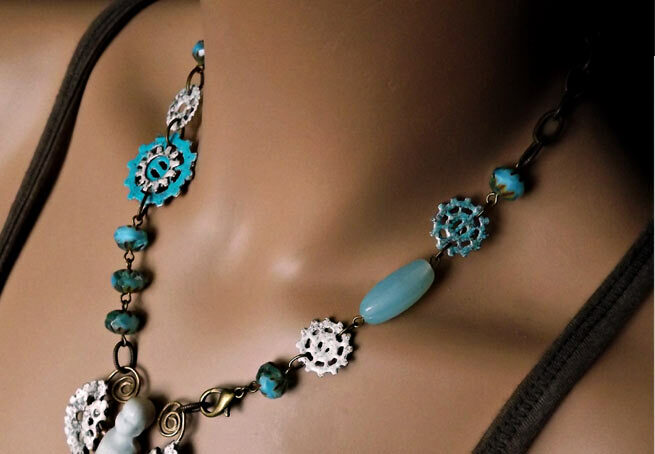 You can always make your neck look stunning by wearing jewelry with large beads, resin, bone necklaces, and so on. The best thing about these ornaments is that they can give a bulky neck a slimmer appearance with their own enormity. Short Wide Neck: Those who have short wide neck should drive the attention of people away from their defective neck shape by wearing long neck jewelry. Choker or other similar ornaments that offering snug fit around the neck are a strict ‘no-no’. Rather, long thin chains are also not recommended for you if your neck is stubby. The length of the chain can be up to your mid-chest or belly region. A large pendant will heighten your look to new dimension. Enrich your collection with a variety of necklaces. They should vary in length, design and style so that you can look gorgeous in all sorts of outfits at a variety of events.